If you have questions on investing in peer to peer loans, feel free to leave a comment at the bottom of the lesson itself, or in our ask a question forum. Lesson 1: An Introduction to Investing in Peer to Peer Loans – Wondering what exactly a peer to peer loan is and what type of returns investors can expect? This is the lesson for you. 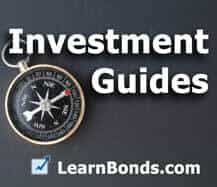 Lesson 2: How Investing in Peer to Peer Loans Differs From Bond Investing – Peer to peer loans are similar to bonds in many ways which is why we cover them here at Learn Bonds. There are some important differences however, which we cover in this lesson. Lesson 3: Lending Club Returns – The Relationship Between Ratings & Returns – Much like bonds, p2p loans have ratings to give investors some idea of the riskiness of the loans. Obviously the riskier the loan the higher the interest rate. That does not however mean that’s where you will get the best return. Here’s how to know. Lesson 4: Peer to Peer Loans (P2P) – How Much Should You Invest? – One of the great things about investing in peer to peer loans, is that you can invest for as little as $25. Here’s one way to decide how much you should invest. Lesson 5: How to Invest in P2P Loans with Lending Club – Lending Club is the largest Peer to Peer firm. They give you three options when investing. Here is an overview of each. Lesson 6: How to Get a Better Return on Your Peer to Peer Loans – Here are 3 tips you can use to help increase your returns on p2p loans. Lesson 7: How to Use P2P Lending to Fund Your Retirement – With peer to peer loans, you don’t have to wait until the loans mature to get your principal back. This makes them an interesting way to increase the income from your investments during retirement. Lesson 8: How One Investor Earns 16% Investing in Peer to Peer Loans – While his returns are not typical, lets see what lessons we can learn from one investor who seems to be handily beating the average returns on p2p loans. Lesson 9: Top 5 Peer to Peer Lending Sites for Investors – If you’ve made it this far you are probably wondering where you can go to learn more about investing in peer to peer loans. Here are 5 great sites with more information. Timely subject. I mentioned on my site.